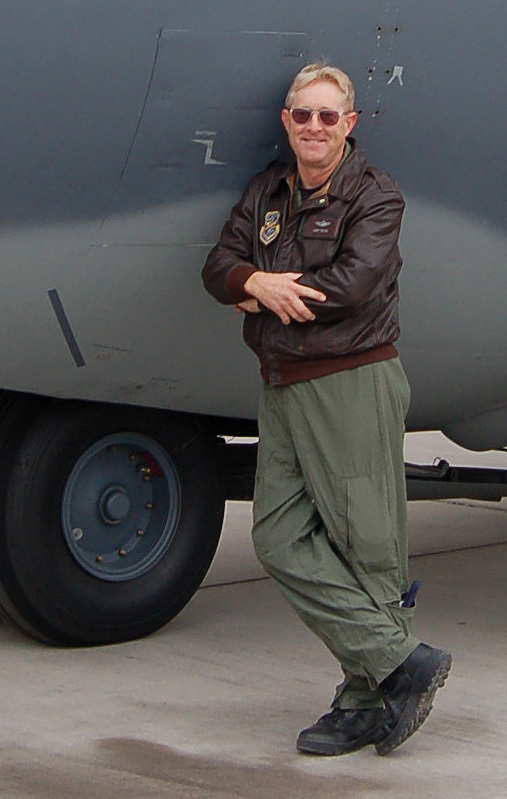 Recent photo taken at Nellis Air Force Base, near Las Vegas. I am a graduate of California State University Bakersfield with a Bachelor of Arts degree in Studio Art and a minor in Communications. I flew for the United States Air Force and the California Air National Guard as a C-130 flight crew member before accepting my present position with the County of Kern, California, Waste Management Department. I continue to fly as a commercial pilot in California Wing, Civil Air Patrol. I have been a steadfast human spaceflight enthusiast since the 1960s and have devoted much of my life to the study of Project Apollo. Two of the three photos in the set below were taken on a visit to the U.S. Air Force Academy on October 7, 1971. I was 14 at the time, and in my freshman year in high school. The LEVA (Lunar Extravehicular Visor Assembly) I'm holding (left) and wearing (center) was worn by Dave Scott on the moon (right) and by Al Worden during his film-retrieval EVA during the trip home to Earth. Scott had presented the LEVA to the Air Force Academy for long-term loan just a few days before my visit. The man in the picture with me was then-Captain Bill Frensley, USAF, who had custody of the helmet at the time. Yes, there was moon dust on the cloth lip of the helmet! The LEVA was bright red inside and so big it echoed in there! We owe these photos to Capt. Frensley. If it were not for him, I'd never have gotten near that helmet or even known it was there. 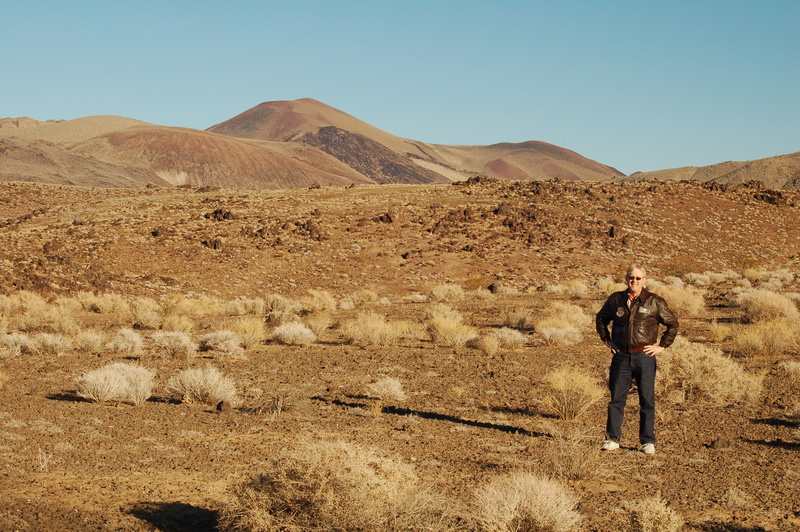 A few years ago, realizing that I live close to where the Apollo16 crew had trained at China Lake, I was able to pinpoint the location and get photographs. Unfortunately, the place where the guys stood is juuuust (sic) inside the security fence that surrounds the Naval Air Weapons Station China Lake. In a high-res version of the photo, you can see the fence on the ridgeline in the near background. unidentified member of the support team is behind them on the right. The main image is one I took more than thirty years later. Next time, I might be able to see the flats from that ridge and thus get a better shot. As long as I stay on the west side of the fence I'll be on public lands in a federal recreation area. I would have gotten closer to the fence on my first visit, but it was winter then, and the wind was howling, so I didn't feel like going too far from the truck! 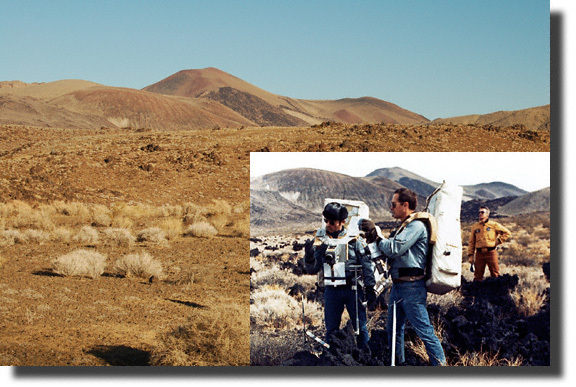 The Apollo 15 crew also trained at China Lake but, to the best of my recollection, Dave and Jim drove a route on the south side of the Coso Hills (John and Charlie were on the west side, farther north), with the Sierra Nevada visible in some of the shots. That would put them on a fairly flat basalt flow, most of which is in a part of the security area that may be visible from outside the fence.